Aaand week 3 is here, only 1 more week to go! Yes – I literally didn’t wear shoes most of the day 🙂 This is my attempt at a skater dress – I preferred the vogue skirt length so I grafted it onto the McCalls top. Unfortunately the top is at least a size too big but this is a really comfy, well-finished make so it still gets wear on the weekends. I love this blouse and need more!! 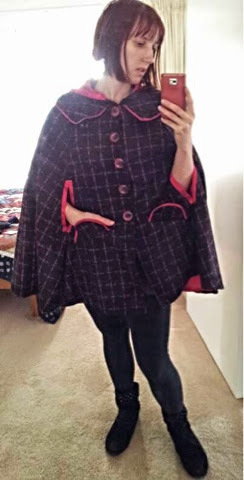 Home sick again today, went out for supplies so cuddly cape was the way to go! Thanks Hannah for snapping this picture right before pole class! Pants: Made by Me – Sewaholic Thurlows again! I wore this with the same boots as Tuesday. Wow, this week crept up on me but finally rounded up all the outfits. Looking forward to our sewing day Pendrell sewalong on Sunday so hopefully I will have a new top to add to the rotation soon! !